After days of overcast weather, British Columbia’s February skies dropped lots and lots of snow of light, fluffy, wet snow. Who would have guessed? Certainly not the celebrities that read the news to us. Nevertheless, there were several inches of fresh snow in the morning that wasn’t there the day before and the white landscape was a grand opportunity for photography. The foggy, white, crystallized, hoarfrost-decorated vegetation I wrote about two weeks ago was gone and replaced with soft billowy snow. Everything was white, and with the increase in temperature I didn’t even need to wear gloves. It’s hard to turn the dials on my camera with padded fingers, and not fogging up my LCD was nice also. I wrote about the previous week’s damp, bothersome cold, however, this day it was comfortable wandering through the snow covered woods and fields. I was quickly reminded that I had to be careful not to get covered with that snow while I trudged through that landscape, I didn’t even get past our garden path before both my camera and I was covered with snow. However, I had a hat, and my camera was easily wiped off with the old dishrag I stuck in my pocket. As always, I also had a lens hood and clear filter on the lens. A lens hood is good under any condition. Not only will a lens hood shade the front lens element from image softening cross light, and protect the lens from front impact, it shelters the lens from snow. 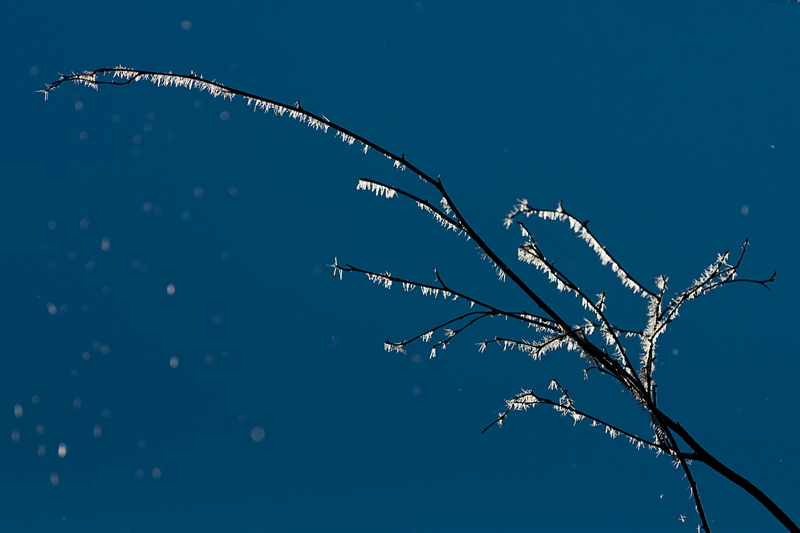 And a filter can always be removed after bumping a lens into a snow-covered branch. I was in no hurry and didn’t know what to expect, so I took two lenses with me. I hoped for some good landscape shots and stuck a 20mm in my pocket and mounted my 200mm macro on the camera. As it was I quickly exchanged lenses and took pictures of our house, the view down the street and photographed the somewhat bushy wooded area across the road from my place. Although I initially began with landscapes, it was the intimate snow covered vegetation that demanded my photographer’s attention and having a telephoto lens designed for very close photography helped with that. Put a wide angle lens on a camera and we tend to miss what is happening up close, but a telephoto narrows our view and the 200mmm macro kept me looking closer and closer as I isolated parts of plants or drops of water on a wire fence. I wandered around for quite a while and took lots of pictures as the light changed. But, when I got back and loaded the image files into my computer I quickly realized those I liked best were from my wife’s garden, but I had enjoyed the long walk in the deep snow anyway. It’s always fun taking pictures even if all you do is delete them in the end. I know that snowy overcast days, or cold foggy mornings, like we have had recently put many photographers off going out and taking pictures, and they wait for the sun thinking there can’t possibly be anything worth photographing in flat light. Obviously, I don’t agree. I am embarrassed to write that I did not fill my obligation with regards to a previous Versatile Blogger nomination. I do have lots of excuses, but I hope readers accept my apology. 1. I have been an active photographer since the 1970’s. 2. I taught college photography credit courses for about 20 years. 3. Writing isn’t so much a struggle – the struggle is choosing and placing the words in a coherent fashion. 4. I am one of those that having learned photography using film – will never ever return to using it. 5. I earn my living photographing people. However, in spite of being very good making pictures of people, given the choice, I would photograph plants and buildings. 6. I have a small shop that on most Thursdays is filled with other photographers drinking coffee and talking photography. I don’t get much done on Thursdays. 7. My wife says I pay rent on my small shop so I can have a place to talk to other photographers. Daybreak was foggy within a white, crystallized wonderland of hoarfrost-decorated trees and vegetation. That scene is what I have been waking up to every day this past week. The damp cold has been bothersome, but what photographer could pass up such a creative opportunity to wander through frosty woods and fields trying out different lenses and locations. I like the search and the discovery. 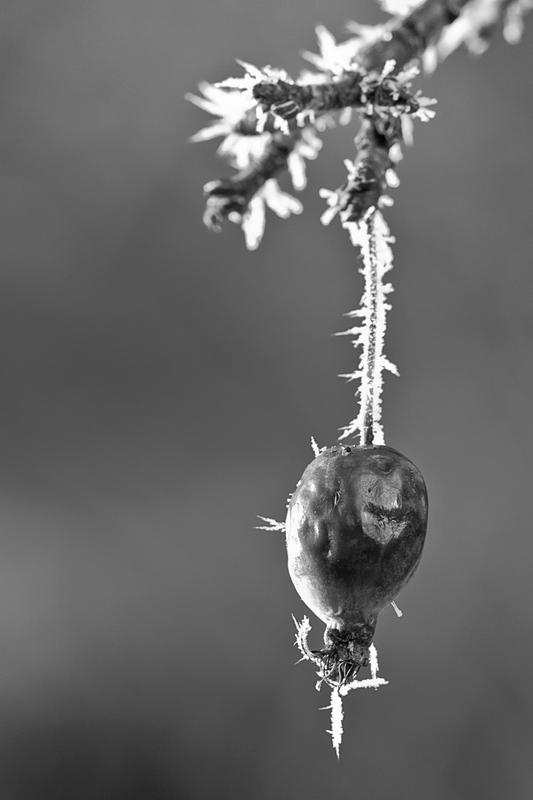 This morning I talked my wife, Linda, into venturing out into the cold to photograph the hoarfrost in her garden. 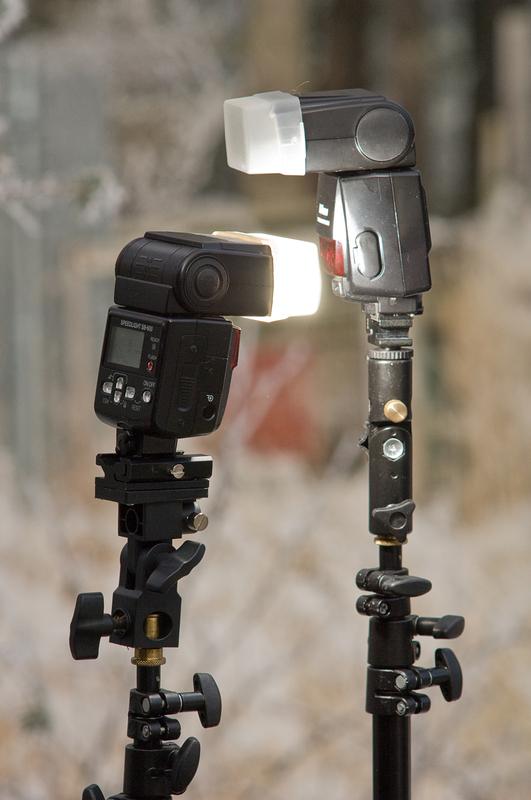 For that we each mounted macro lenses on our cameras and I included a flash mounted on a light stand for both of us. There was a time when we would have been burdened with wires running from the flash to camera, but those days have passed now that wireless flash technology has become the standard. The morning was overcast and foggy, so the addition of flash was a must in the dim light. 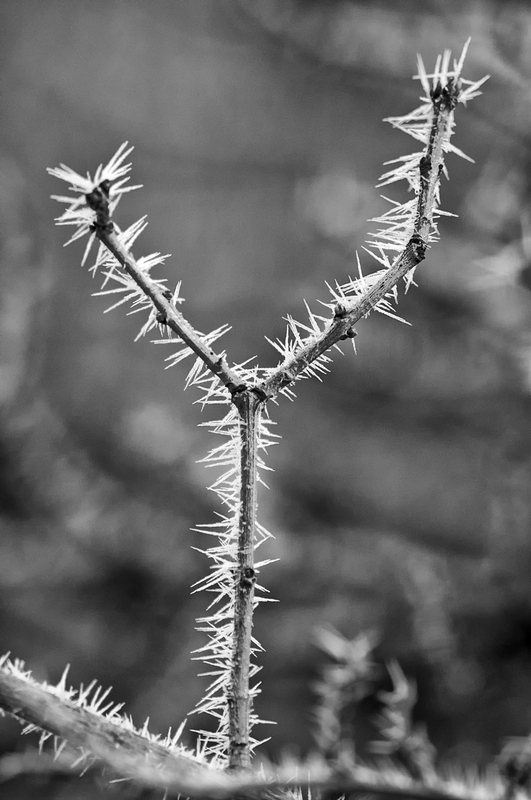 I have a ring flash that I like to use when I photograph plants, but the white crystalline hoarfrost would have been easily over exposed with the direct light from a flash mounted around my lens and I wanted to preserve as much of the delicate details as possible. All we had to do was position our flashes for the best light angle. Our cameras allowed us to sync the shutterspeed above 1/250th of a second. Many modern cameras have a feature in their menus called “Hi-Sync” or something close to it and I recommend readers check their manuals on how to select and use a high flash synchronizing speed so they won’t be limited to 1/250th of a second shutterspeed. Handholding at 1/500th of a second (or greater) reduces camera shake and with the addition of flash it is easy to stop any plant movement. Whenever I use a flash outside I like to reduce the ambient light by a stop or two so that if I didn’t use a flash the scene and subject would have been under exposed, consequently, I add the flash to illuminate the main subject, and those elements that the flash doesn’t affect are under exposed, and that flash is off camera sending light from the side or the rear, not limiting us to the on camera flash directly in front of the subject, or forcing us to position ourselves dependent on the sun. We had a lazy morning and got out late, so although we both prefer to use tripods for close-up photography, we needed to working fast as the temperature rose. We could hear and see the crystals falling with the morning breeze. I suppose if we had a warm outside couch and been bundled up, just sitting on the porch would have been nice. Nevertheless, we got right into photographing our frosty subjects only stopping when we had to reposition our flash. I approach and light a plant the same way I would a person. I begin by checking the exposure with my camera meter. I always use manual mode so in today’s foggy low light and because I was using hi-sync I could keep my shutterspeed at 1/650th and sometimes higher. Next I chose the best angle of view for my subject, and as always pay attention to what’s in the background. Lastly, I move the light around making exposures until I am satisfied with the highlights and shadows on my subject just as I would if I were doing portraiture of an individual. 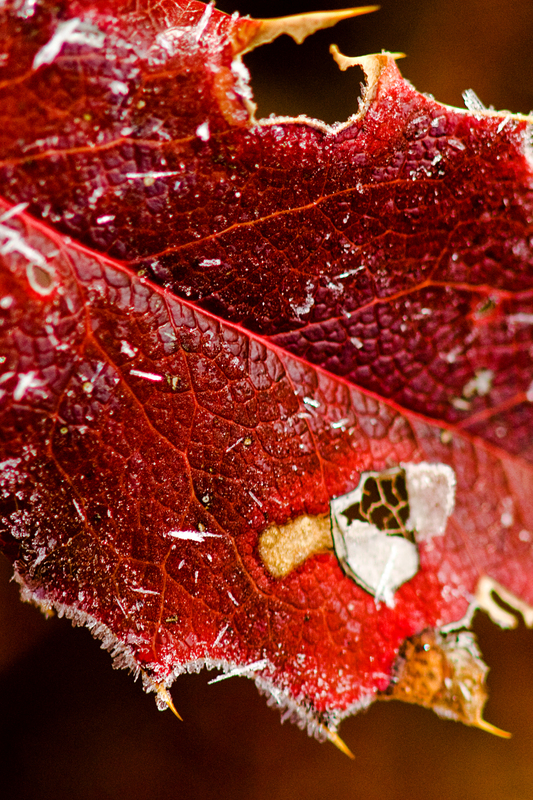 I like foggy, frosty mornings and the last few days have been a great time to wander around with my camera. Soon everything is going to change. The frosty vegetation will be replaced with green buds and the cold, foggy, overcast days will be filled with sunny days and blue sky. Yes, I am looking forward to that, but for now winter is a creative challenge and I wouldn’t change it. And thanks to 96arley (www.shootabout.com) for the nomination. I am still a bit surprised when people inform me they have decided to keep using film cameras in this day and age of high-quality digital camera image output, and that is just what I was told by a couple last week. Of course, my response was that they should use whatever makes them comfortable. I find that many photographers using film want to offer a rationale for using film and make statements like “this camera has always taken very good pictures”. I suppose that’s a rational statement, however, but the difference between digital and film is like driving an old 1970 Ford sedan and the newest Ford hybrid model across Canada. There is a lot more performance, comfort and options available for the operator of the newer model so that the experience can be more pleasurable and certainly more efficient. This couple were so emphatic about how great their old film cameras produced pictures that I assumed they do their own darkroom work, but they take their film into a lab that processes it, then scans it to a computer, then with predetermined settings the computer makes the desired print sizes. Hmm, not much photographer input there and most of the process seems to be digital technology. Oh well, at least they are taking pictures. I do believe that digital camera users become better photographers faster because of the instant reinforcement of their camera’s LCD, then again because it is so easy and quick to check images on a computer display. Last Thursday my shop was filled with people discussing equipment. I have to mention that just before I talked to the film camera couple, I had been discussing digital cameras, but the question was “ What’s the best digital SLR camera, what do you like?” Well, I like them all. I haven’t had the chance to try every new camera out, but from my reading I think Nikon, Canon, and Pentax all have excellent products. My advice was they should first decide what they had available to spend, and then decide on how they like to shoot: sports, landscapes, family and so on. Of course any camera will do everything, but some are better for sports and some won’t hold up to the elements if packed on your horse or bounced around getting cold on the back of a snowmobile. My suggestion was before they choose to do some research before they buy. But film? Well if one is into “retro” or likes to experiment with technology from the past picking up an old film camera and the equipment for processing and printing doesn’t cost much and might be lots of fun. However, for those like me that are dedicated to producing quality photography I would, of course choose a DSLR (digital single lens reflex) camera. The scenic hour-long drive from Kamloops to Barriere always has me wanting to pull off the road and take pictures, but for the two previous Sunday mornings stopping would have made me late for the two-session class I was leading and 18 enthusiastic photographers who would have been left wondering. I remembered being told, “Once photography enters your bloodstream, it is like a disease”, and I am sure they would have patiently smiled if I loaded my morning’s images into the projector and said, “I couldn’t help my self”, after all they had “photography in their bloodstream” too. The class wasn’t so much about photography as it was about “demystifying” the digital camera. My goal for the two-day session was to help participants become comfortable and familiar with their cameras. I wanted them not to be afraid to push all the buttons, scroll through menus and change default settings as they explored each function. We discussed controlling exposure, understanding the histogram, and manual metering. Then we talked about the relationship between the aperture and the shutter to better understand depth of field. For those interested in scenic photography I included a section on photographic composition, and finally there was time set aside to consider selecting lenses, tripods and presenting information about other accessories that enhance the photographic experience. I know that some felt overwhelmed as we examined the myriad of features available on their modern cameras. As camera technology advances and more options are added new users will certainly feel intimidated, but as they use their cameras and become more familiar with the possibilities they realize the added options give more and more control over picture making. Interactive lecture classes like this one are more demanding than the usual photography classes that assume participants already know how their camera functions. In my opinion that assumption often has participants going home without understanding camera basics, and although they can read their notes on panorama, portraiture and scenic photography most revert to using the camera in it’s point and shoot Program modes. What a waste! I always enjoy these types of sessions where eager learners ask lots of questions and are demanding of information that will help them to pursue their particular interest in photography and I get to really delve into the mechanics of this amazing pastime. To me there is more than just aiming the camera at some subject, and, depending on technology, to magically transform that passive action into a photograph. And that was what I wanted the two sessions to be about. In this study group I was fortunate enough to have active photographers Jill Hayward and Shelly Lampreau sitting in. They were not only were responsible for organizing and advertising the two-day class, but jumped to help when I wasn’t able to get to someone right away. It’s people like Hayward and Lampreau that make an interactive workshop all the more valuable to learners and I extend my appreciation to them. The class was filled with serious people that really wanted to learn about photography. I had a great time and I thank everyone for inviting me, and there is a plan to get together again in the spring and do a day of scenic photography in Wells Gray Park. During the class there was an announcement that Barriere photographers will shortly be starting their own photography club. 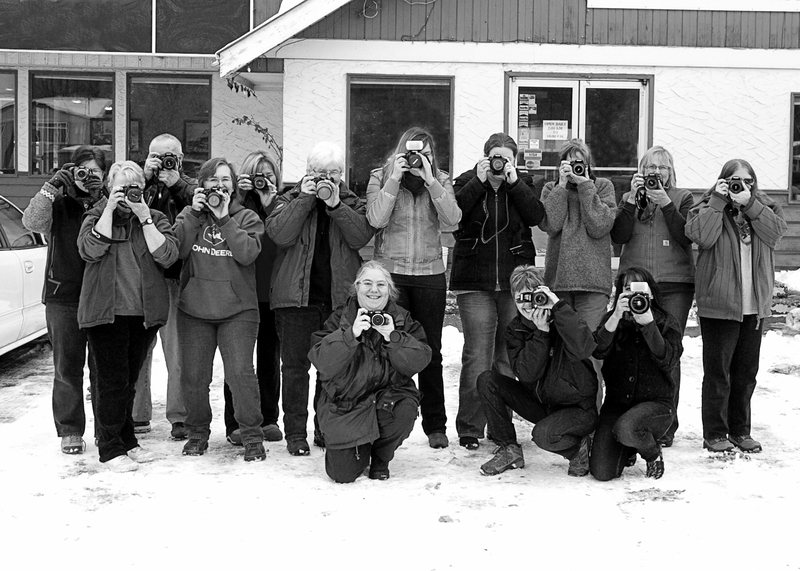 Those interested can now connect with others on the Barriere photography club’s Facebook page.